Reorders the RGB channels of the source clip. 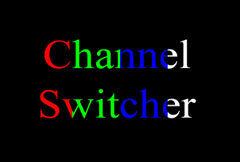 Allows mapping any source channel into any output channel, with scaling and offset for each output channel. Use the Red, Green, and Blur popup menus to select the results for each output channel. Scale Lights R: Default: 1, Range: any. Scales the brightness of the output red channel by this amount. Scale Lights G: Default: 1, Range: any. Scales the brightness of the output green channel by this amount. Scale Lights B: Default: 1, Range: any. Scales the brightness of the output blue channel by this amount. Offset Darks R: Default: 0, Range: any. Adds this value to the darker regions of the red output channel. This can be negative to increase contrast. Offset Darks G: Default: 0, Range: any. Adds this value to the darker regions of the green output channel. This can be negative to increase contrast. Offset Darks B: Default: 0, Range: any. Adds this value to the darker regions of the blue output channel. This can be negative to increase contrast. Red <-: Popup menu, Default: Red . Selects which channel of the source to use as the output red channel. Red: Use the red input channel as the source for this output channel. Green: Use the green input channel as the source for this output channel. Blue: Use the blue input channel as the source for this output channel. Luma: Use the input luminance as the source for this output channel. 1: Use a constant 1 value (fully on) as the source for this output channel. 0: Use a constant 0 value (fully off) as the source for this output channel. Green <-: Popup menu, Default: Green . Selects which channel of the source to use as the output green channel. Blue <-: Popup menu, Default: Blue . Selects which channel of the source to use as the output blue channel.